"Traditional Asian Dessert At Its Best"
Have a love for Gulab Jamun? Red Cow Dairy is the name to trust. Having years of experience in delivering consumers with delicious sweet dishes, we are one of the most preferred brands. Our focus is always on using fresh quality cow milk in all our dairy products, be it curd, paneer, cow ghee, rasgulla or the most favourite Gulab Jamun. 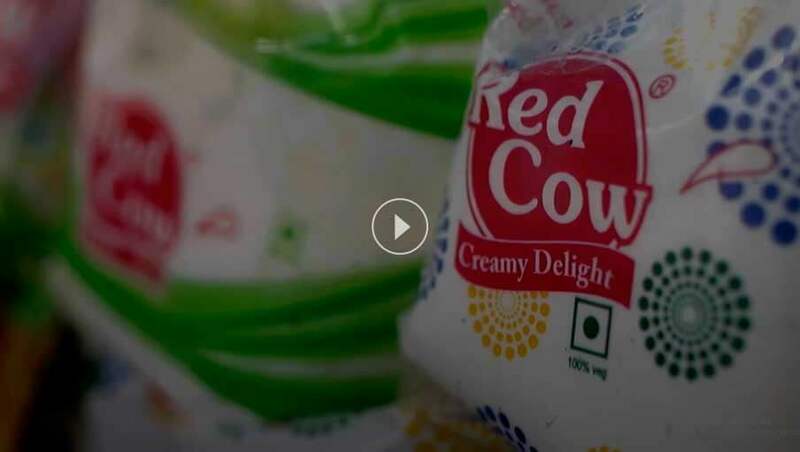 Established in 1997, through the course of time, Red Cow Dairy Private Limited has projected itself to be one of the largest private sector dairies in Eastern India. We value our customers and always focus on meeting their needs and expectations. Making use of contemporary techniques, our dedicated team of professionals aims at providing you with mouth-watering Gulab Jamun of supreme quality. "Every Bite Is A Sinful Indulgence"
This traditional dessert has been the love of every Asian sweet lover from time unmemorable. Made with either milk solids or freshly curdled milk, each variety has a distinct appearance and taste. Be it any party, birthday celebration, marriage ceremony or a festival, a flashing of its name in the menu can bring a smile on the face of every sweet lover. What's more? According to a recent survey, the occasional serving of a single piece Gulab Jamun, even 2 to 3 balls, won’t affect your heath or diet plan. "A Nutritional Treat For Your Taste-Buds"
The size of a single Gulab Jamun is more or less like a ping-pong ball. The calories in each depend on the recipe used, and so does the nutritional value. Generally, a ball of the moderate size has around 150 calories. Being made of milk, they are rich in calcium and especially good for the bones. Having a single piece on daily basis fulfils 10% of your recommended calorie needs per day. But if you are heath conscious, just make sure not to overeat. "Tastes As Good As It Looks"
Each Gulab Jamun prepared at Red Cow Dairy Private Limited are not only lip-smacking but healthy as well. Professionals involved in the manufacturing process aims at making use of only fresh ingredients, which includes clarified butter called pure cow ghee, milk powder, baking powder, flour, cardamom, oil, milk and occasional uses of raisin and nuts. These balls are dipped in sugar-syrup flavoured with cardamom, saffron or rose-water and garnished with kesar, vark or almonds. How To Prepare Gulab Jamun? Mix ground cardamom with sugar and water and bring them to boil. Stir continuously till the syrup become a bit sticky. Mix rose water and keep the prepared syrup aside. Sieve and mix flour, milk powder, and soda uniformly. Add ghee to the dough and mix well. In a separate vessel add 1.5 tablespoons of yogurt with milk and add it to the dough. Once the dough becomes sticky, grease your hand and start preparing balls. Make sure the balls are not soggy but firm enough. Heat ghee in a pan and add the balls when it is medium hot. Fry the balls till it is golden. Avoid turning them brown. Add the fried balls to the lukewarm syrup. Let them set for 3 hours before garnishing your gulab jamun. Though every bite of a Gulab Jamun is truly delicious, preparing them at home is too time-consuming. The best alternative for every sweet-lover is to buy a pack of Red Cow Dairy Gulab Jamun and treat your taste buds. Why Trust Red Cow Dairy for Gulab Jamun? "The Most Preferred Name For All Lovers Of Gulab Jamun"
Fresh cow milk is used in all our products. Well-skilled and trained personnel are deployed to ensure the quality of Canned Sweets at each step during the manufacturing process. Under no circumstances do we compromise the quality of raw products used. All products delivered are guaranteed to be of the safest quality. The syrup is dilute and moderately sweet and even preferred by the health conscious. Focus on maintaining our reputation of being one of the largest private sector dairies. "Buy Mouth-Watering Gulab Jamun At Affordable Prices"
Do you have a query in mind? Contact Red Cow Dairy or quick call at 03212-230492 today.